The Points are not an issue, its the line/lines entering and exiting at the nodes. I was looking to use the Geometry Generator to solve the issue, by creating a buffer, based on the midpoint of each section of the multiline geometry, less the length of the start line and end line and using dissolve to create the line. The dataset is a PostGIS vector dataset, I cant duplicate or break the lines into individual lines. You can use the following expression together with geometry generator. Use Linestring as geometry type. Adjust the buffer distance to your needs. Not the answer you're looking for? 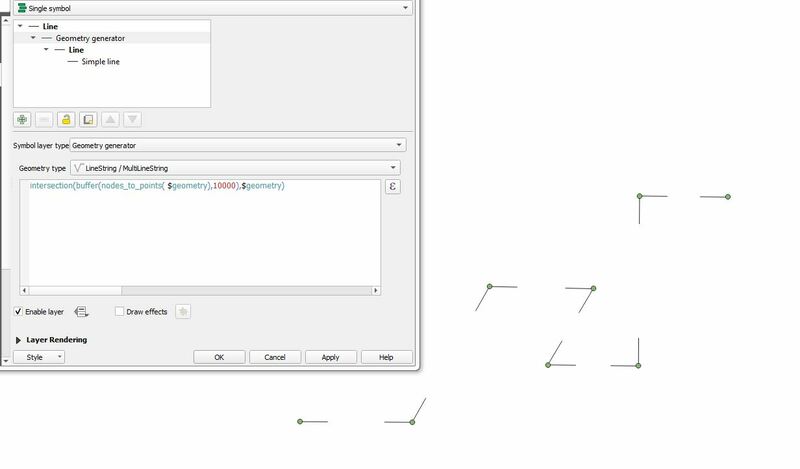 Browse other questions tagged qgis postgis geometry-generator or ask your own question. How to graphically offset the boundary line of a polygon in QGIS? Styling shared boundaries in QGIS?